When you’re good, word has a way of getting around. 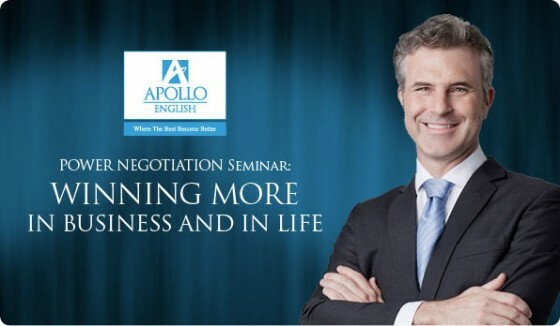 Apollo English heard about my Power Negotiation course and asked me to teach a two-hour workshop for them. It’s called “Power Negotiation — Winning More in Business and in Life” and will be held in October in Saigon. Apollo is sponsoring so the price is a very low 100,000 VND. I guarantee if you follow just one of the seven principles I’ll teach during the workshop you’ll win more in business and in life. Why not try it? Limited seats available. Click on the picture above and sign up today! Want to know what others think? See feedback from students of my full Power Negotiation course here. I believe that I will learn a lot of meaningful lessons at your class. See you in October.